When Frozen was released, I was immediately captivated by the story and the characters. Both Elsa and Anna are amazing additions to the Disney universe and it’s a movie I keep going back to over and over again. 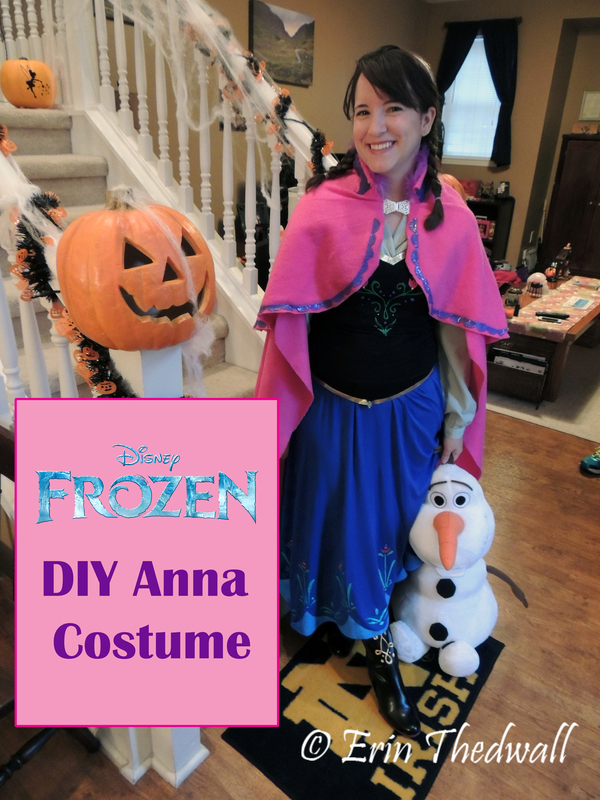 For Halloween last year, I used Anna as my costume inspiration. I take Halloween pretty seriously, and each year we have a very competitive costume contest at work. In fact, I won the previous year with my Daenerys Targaryen costume. So I did a lot of research on what other people have done. Although I ended up making a lot of changes to how I made my costume, Adree Cosplays has an amazing guide on how she put her costume together. She is much more talented than I am and created the pieces by sewing them herself. To create the design on the skirt, I used a combination of puffy fabric paint and matte fabric paint. There’s great reference material on Deviant Art from MomoKurumi, who actually created stencils and patterns for all of the embroidery designs. 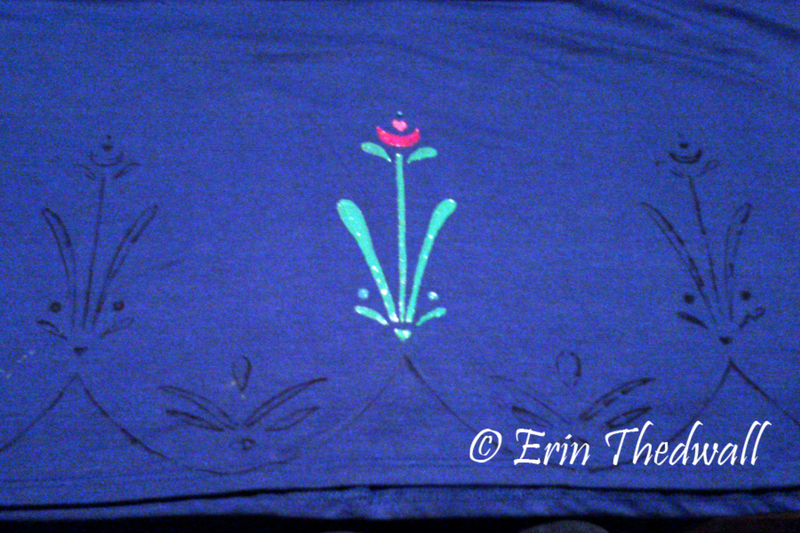 From those designs, I printed and cut out stencils to use for the skirt “embroidery.” I traced the design around the entire skirt in sharpie. I tried to use a fabric pencil at first, but it didn’t agree with the stretchy maxi fabric. 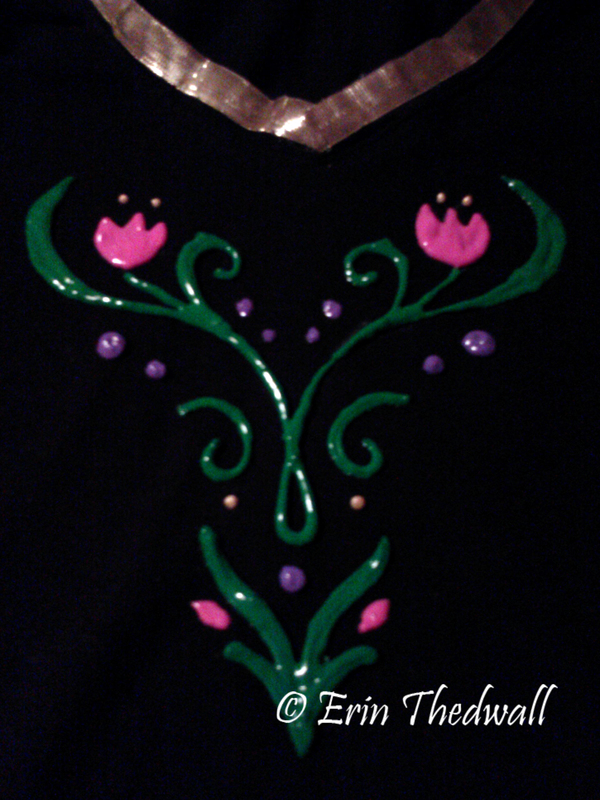 Then, I filled in the pattern using puffy paint. The puffy paint easily covered up all of the visible sharpie lines. I laid my skirt out on a folding card table as I painted, and just rotated it as I went along. 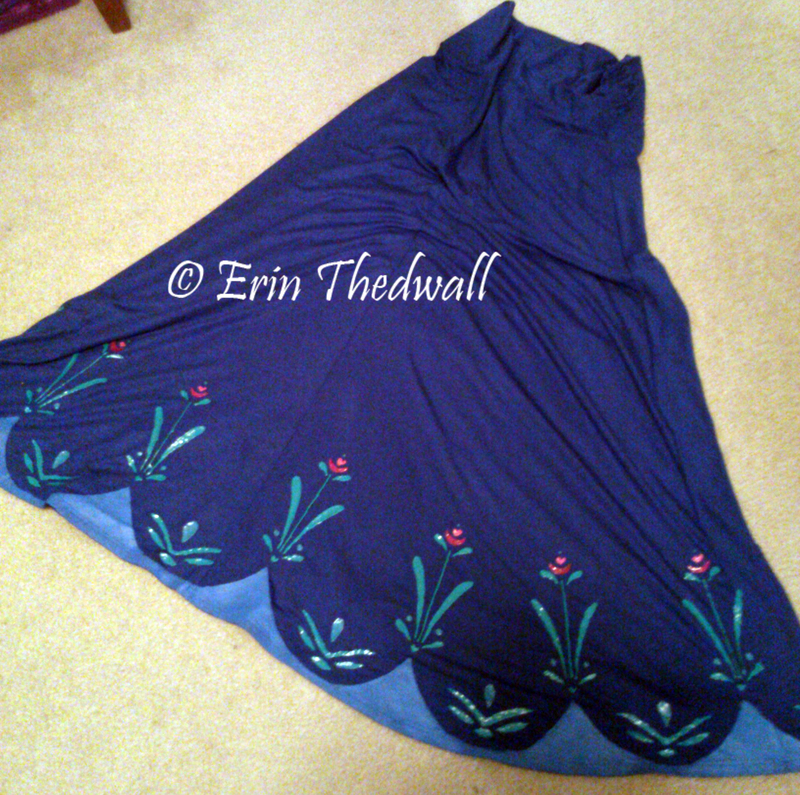 It took a few days to get the whole skirt painted as I let the puffy paint dry in between rotations. I then brush painted the matte fabric paint into those bottom swoops between the flowers – it gave it a slightly different look from the dimensional “embroidered” puffy paint. I couldn’t find a black vest already made that had the same shape as Anna’s, so instead I took a v-neck black t-shirt and carefully cut the sleeves off. I also cut the V into the bottom front of the shirt and shortened the back of the shirt to reach the top edge of the V.
Then I used a combination of stitches and hot glue to add gold ribbon trim along all of the edges. 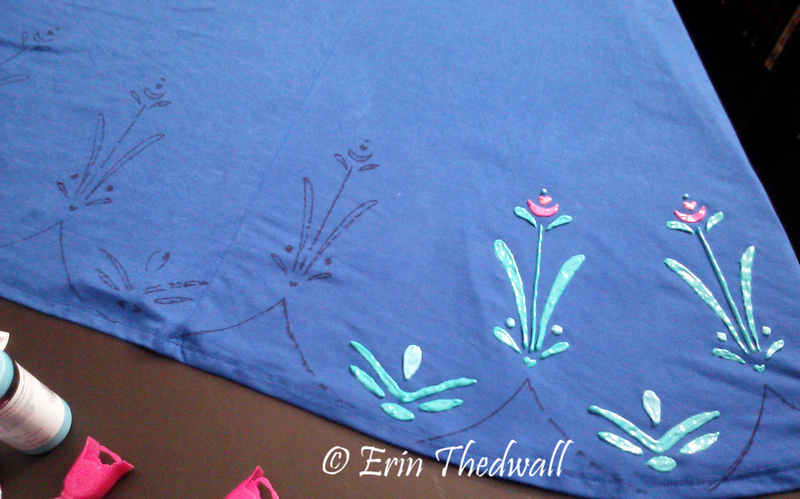 Like the skirt, I traced on the pattern – this time using the white fabric pencil. Then I filled in the design with the puffy paint. 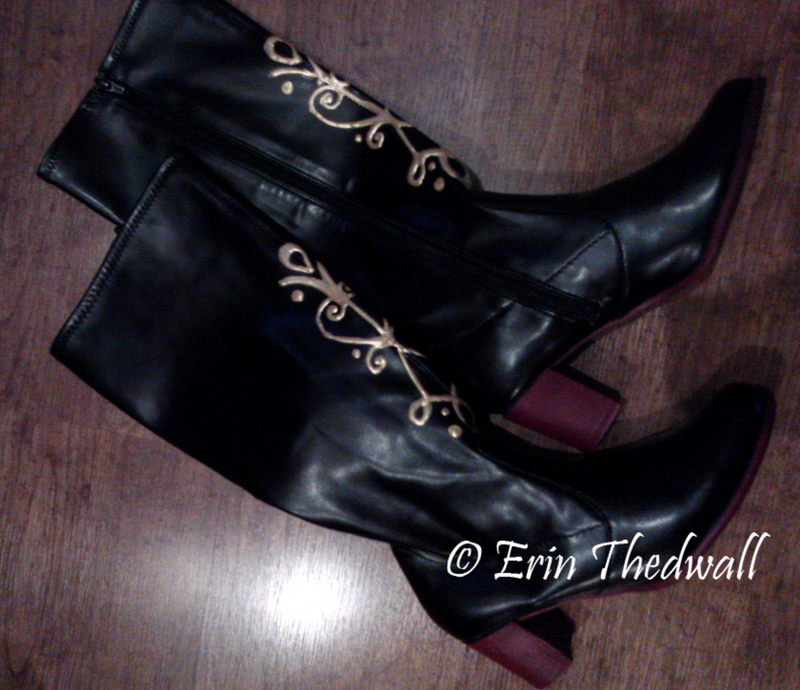 For the boots, I added several coats of pink acrylic paint to the soles and heels of the boots. 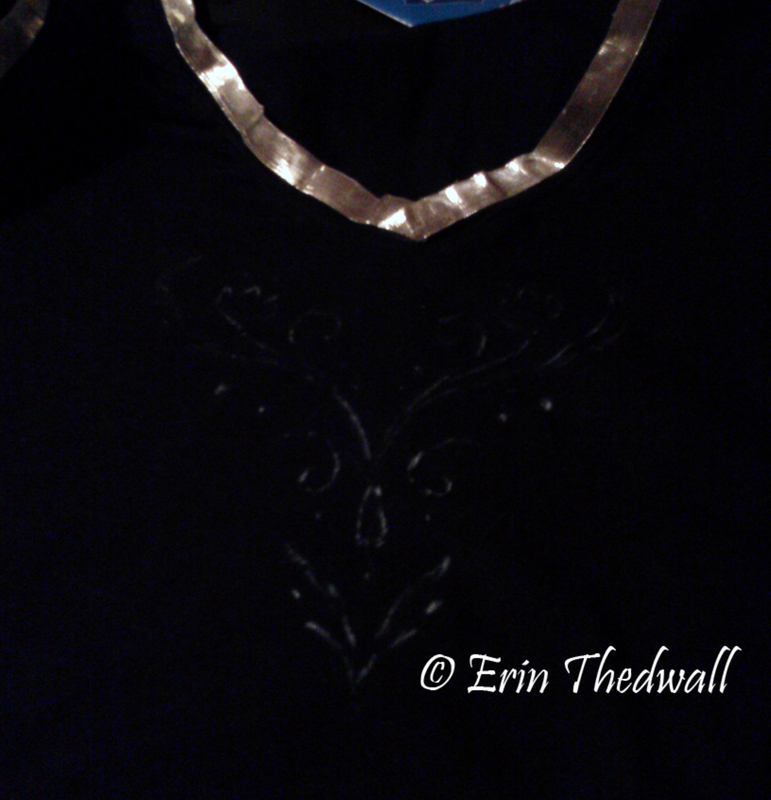 Then I used gold puffy paint to add the detail to the front. It took a fair amount of sizing and resizing to get the cloak to fall the way I wanted around my shoulders. 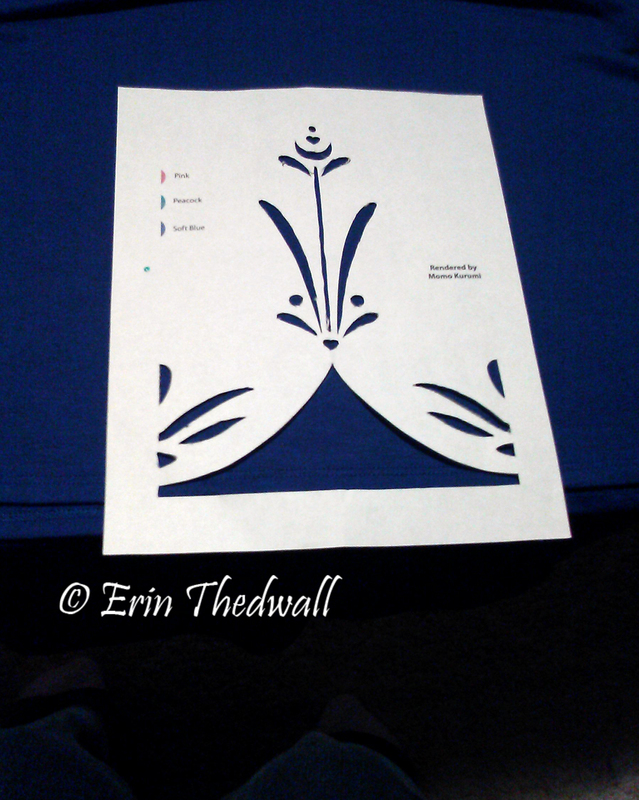 I also made it in two parts – the base and then that top overlay. I used a combination of stitching and hot glue to attach the pieces together. Then I decorated the edge of the top piece with purple puffy paint. I glued a strip of purple felt around the outside of the collar, and the purple feathers along the inside. 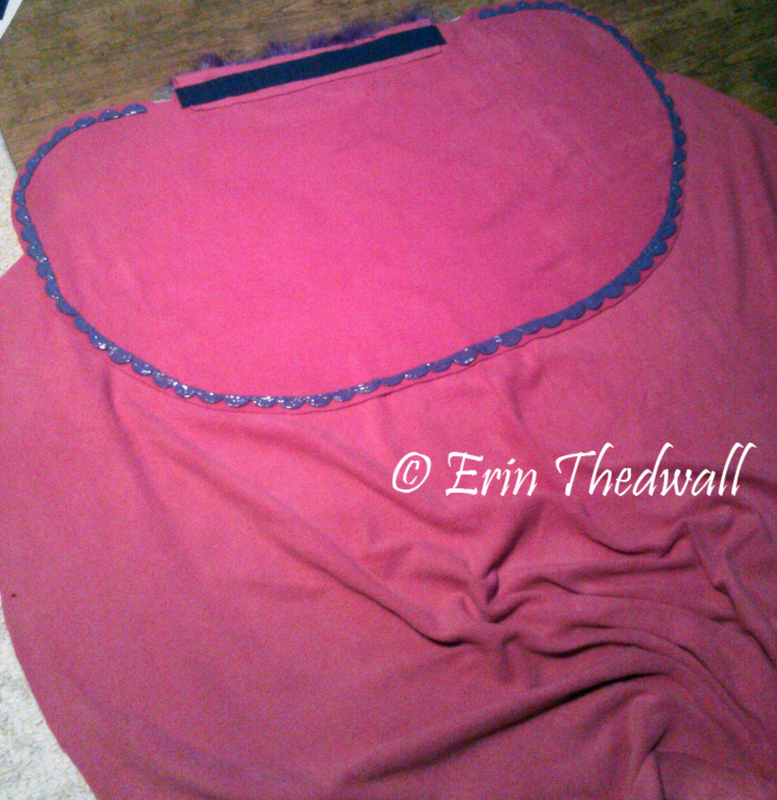 Then I stitched the clasps to the edges of the collar. 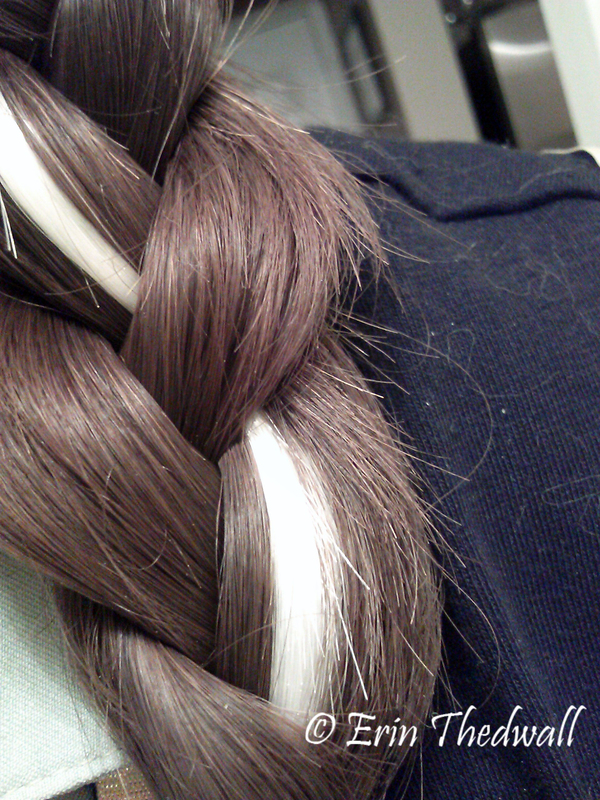 I also ordered a white clip-in highlight to add to my hair in a braid. Here’s a look at the finished product! 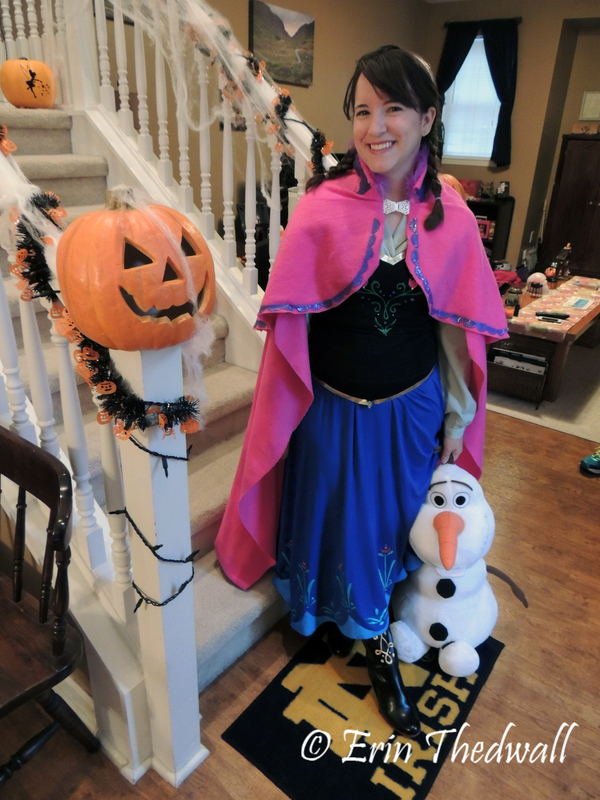 Princess Anna is ready for Halloween! Nice idea with the puffy paint on the boots. Did it stick? or did you have any issues with it peeling off? 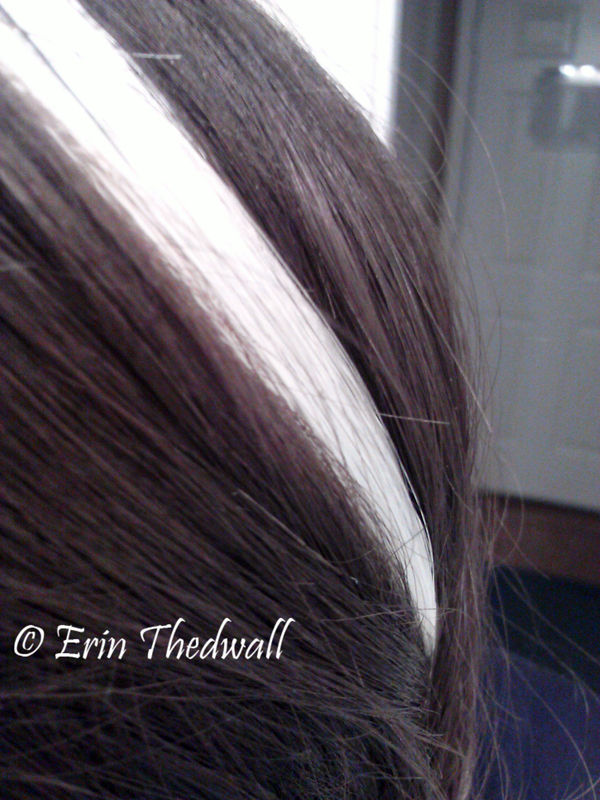 I also like the idea of the the white hairpiece. Nice job.